The Branch Club of the Year, the Albatross Club RAFA, Bexhill, has made it through the various rounds of the competition to reach the National Final, so it will be for a future article to report on its progress in more detail when the outcome is known. Whatever happens the Club, its steward Karen Pelham and the staff deserve hearty congratulations. The Branch Pub of the Year, the The Tower, made it one stage further to become Sussex Pub of the Year, before narrowly losing out to the Surrey Pub of the Year in the next round. Again, congratulations are due to all at the pub, in particular to landlady Louisa Gover, who is shown in the picture receiving the award from Peter Adams, Branch Chair. 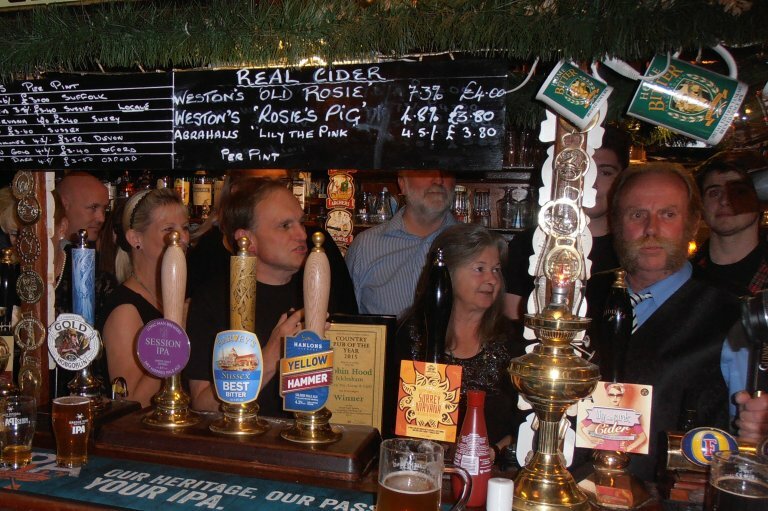 This was the first year the pub gained a CAMRA award, but ended up with four, as well as the two already mentioned, it was also the branch Cider Pub of the Year and the Community Pub of the Year. 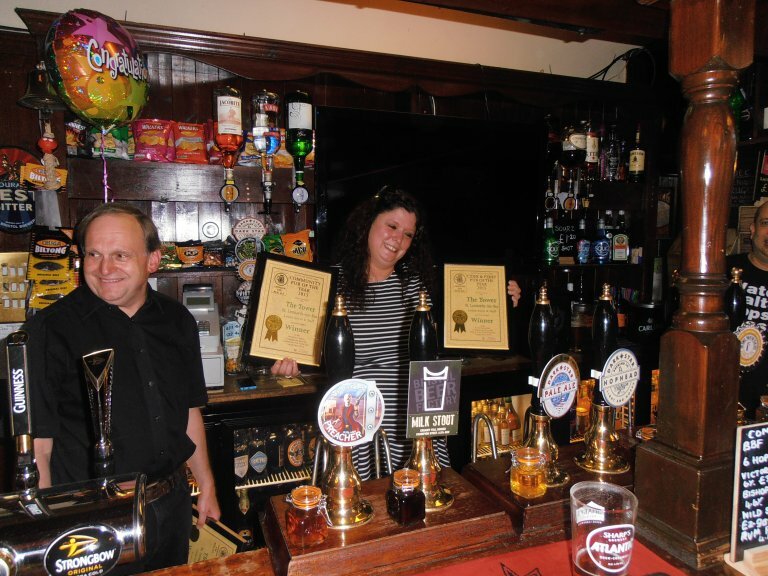 Another first time award was to Andy and Jo Plumbley of the The Crown Old Town Eastbourne, the LocAle Pub of Year. The picture shows Andy receiving the award from Peter Adams. Finally the Country Pub of the Year went to the The Robin Hood, Icklesham. This pub has been a regular recipient of branch awards since it was the Branch Pub of the Year in 2012. 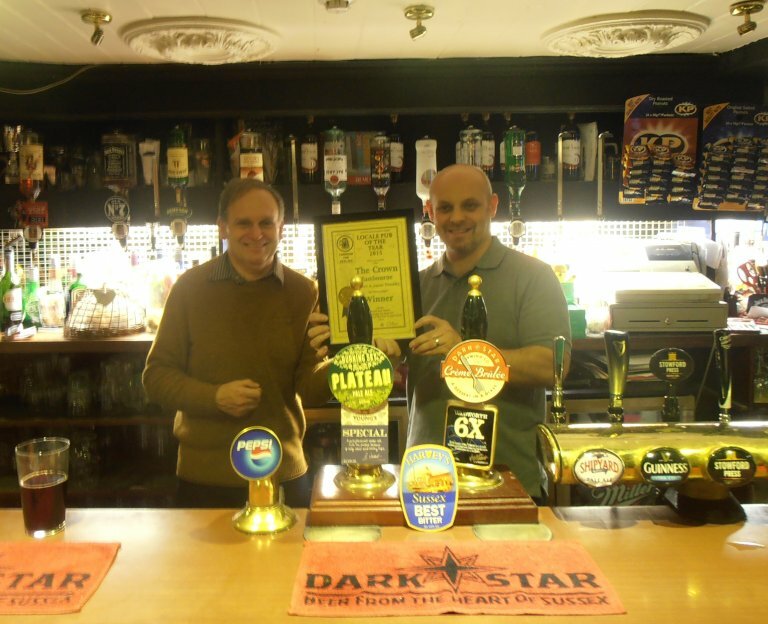 D’Arcy the landlord insisted that all his staff should be packed in behind the bar for the award, as the picture shows. As well as congratulations, branch members would like to thank the fantastic reception each pub gave them when visiting to make the awards.